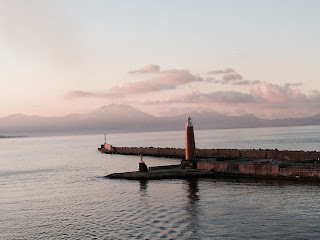 After our last relaxing day at sea, we docked in Naples very early on Thursday morning. 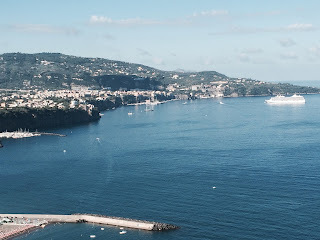 We had arranged for a private tour for the six of us to see the ruins of Pompei and to drive on the Amalfi Coast. Our driver, Umberto, met us at 8:00 and we headed south. He said that everyone goes to Pompei first and the traffic and crowds are terrible, so we are going to go south first and end at Pompei. That was fine with us, and we set off in his comfortable Mercedes van that could take 7 passengers. On the way, he told us about a restaurant we could stop at for lunch that is on a farm and everything they serve is fresh from their own gardens. We agreed and he called for the reservation. 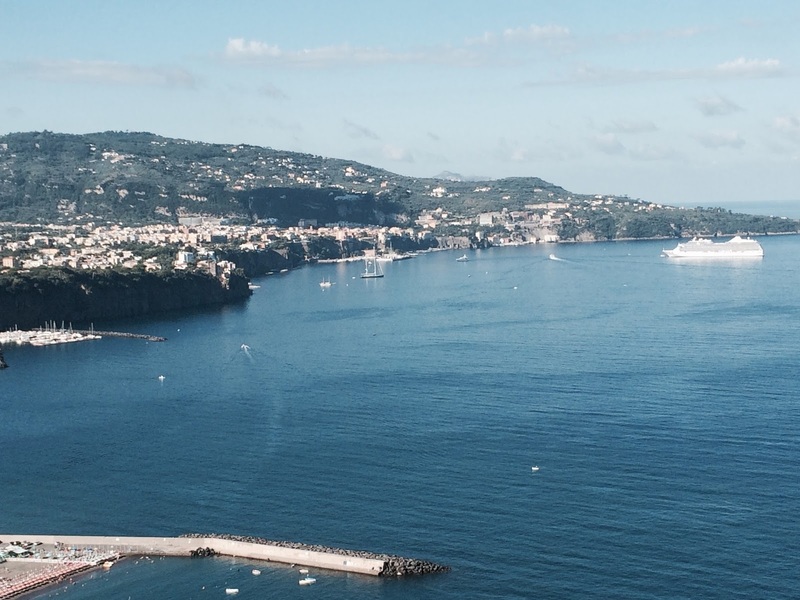 After crossing the Milky Mountains through three tunnels, we arrived in Sorrento on a beautiful bay. [The Milky Mountains are named that because they make the best cheese.] He let us out at the center square and we walked around and enjoyed the small shops on a very tiny street. 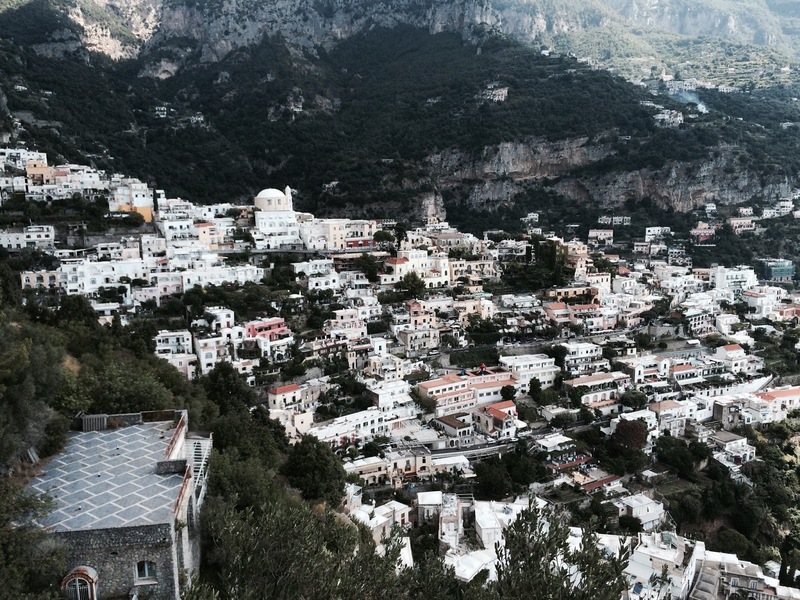 From there we drove to Positano, a postcard-perfect town on another lovely bay. 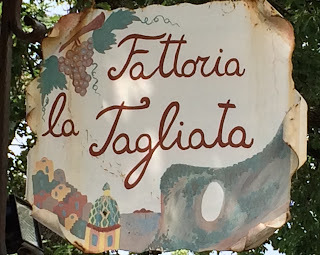 We drove up above the town and around another mountain to arrive at the Fattoria la Tagliatta, the farm he had mentioned. It was very picturesque and we could eat fresh cherry tomatoes from the vine. We had a prix fixe meal with six appetizers, four pastas and two desserts. Way too much food, but some of the most delicious we have ever had. I’m not sure if I can upload all my photos, so I will plan to do more pictures when we are in our hotel in Rome on Friday afternoon. After lunch we headed back around Positano and Sorrento, through the tunnels, and to the site of Pompei. Mt. Vesuvius is right there, towering over everything. It is expected to erupt again in the next 20 years or so, but many people live in the “red zone”, the area that is most in danger when it erupts. The city is fascinating. 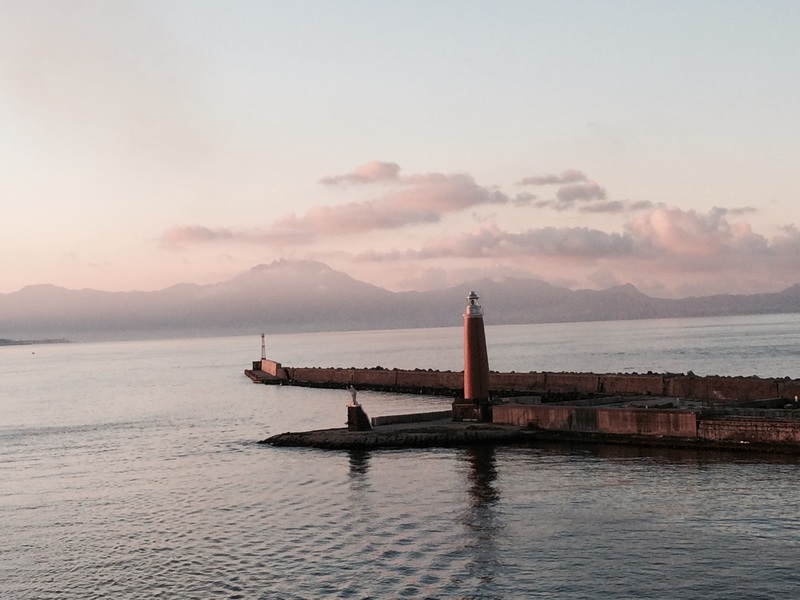 It was an old trading port. The Romans took it over around 89 BC and the big eruption was in 79 AD. So much of the building is what the Romans added to the city that was already there. Our guide, Rossanna, was very personable and knowledgable. She told us so many things about what we were seeing. Again, I will try to post more pictures tomorrow. We arrived back at the ship about 4:30, happy for some showers and resting time before our last dinner. We leave the ship in the morning and transfer to our hotel in Rome, where we will be for the next four nights.